In our constant search for furniture models and assets that could help the reader of Blender 3D Architect to work faster, we usually try to get high-density meshes that will give you a great sense of realism. However, you may also need some simpler furniture models for some particular types of projects. For instance, you may have to work in a Web VR app to show an interior and a high-density mesh could slow down the app. Do you have some low poly furniture assets in your library? Today you can download twenty of those models from an artist called QuaterniusDev. The models are available in FBX, OBJ, and blend formats. 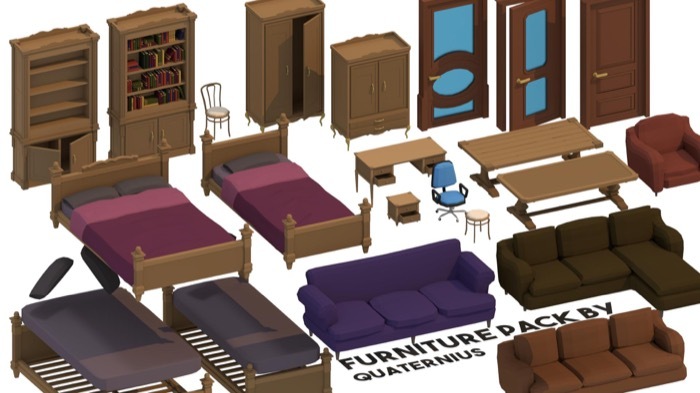 You will find low poly versions of chairs, sofas, wardrobes and much more. They don't look like design furniture and have in most cases an ordinary look. One of the benefits of this collection is that you won't have to import or convert the files since all models have a version in Blenders native file format.